Arkansas environments allow for thriving mold growth, structural decay, and poor indoor environmental quality in both its commercial and residential structures. In response to these problems, Crawl Space Solutions of Arkansas has established itself as a leader in air filtration issues and crawl space encapsulation. Have questions? Just let us know and we will be happy to explain what is wrong and how we will fix it ... we are here to help. If you are dealing with basement, crawl space or foundation problems and live in Pine Bluff, El Dorado, Jonesboro or nearby give us a call. We offer a variety of options for insulating your foundation..
We offer a free, in-home inspection and cost estimate on our crawl space & basement services. Finance your crawl space encapsulation or basement waterproofing project. We make it simple. Crawl Space Solutions of Arkansas offers permanent crawl space and basement repair solutions in all of Arkansas. We provide dry crawl spaces and basement waterproofing to homeowners in Arkansas areas. In addition to a complete and lasting solution, our system acts as a passive barrier for radon, insects, and also prevents warm, humid outside air from entering the space. As with any other major home improvement, it’s important to know that your crawl space and/or basement contractors are experienced and reputable. Being an authorized Basement Systems Dealer means that we've completed a rigorous training series at their International Headquarters and have successfully completed certification tests in the areas of installation, system service, waterproofing system design, and customer service. I wanted you to know how much my husband and I were impressed with the three young men who did our installation. Chris and Brian didn't mind getting dirty and worked hard every day. The crawlspace looks better than I ever imagined. We have grown, and continue to grow, as a leader in the basement waterproofing and crawl space industry offering unsurpassed products, services, warranties, and overall satisfaction. We don't just fix basements and crawl spaces, we help people! 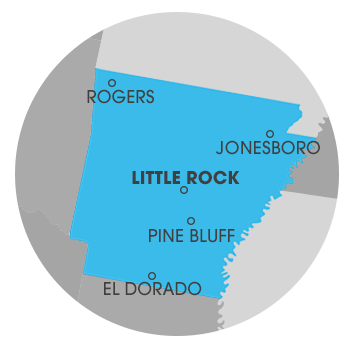 We service homeowners and businesses in Little Rock, Jonesboro, Benton, Sherwood, Pine Bluff, and areas nearby in Arkansas.